If your snow tendencies run more toward sipping hot chocolate than hurtling down slopes; and steaming bowls of ramen than frozen mountain bowls, here’s your list of where to hang out when the cold winds blow in the Banff-Lake Louise area of Alberta. 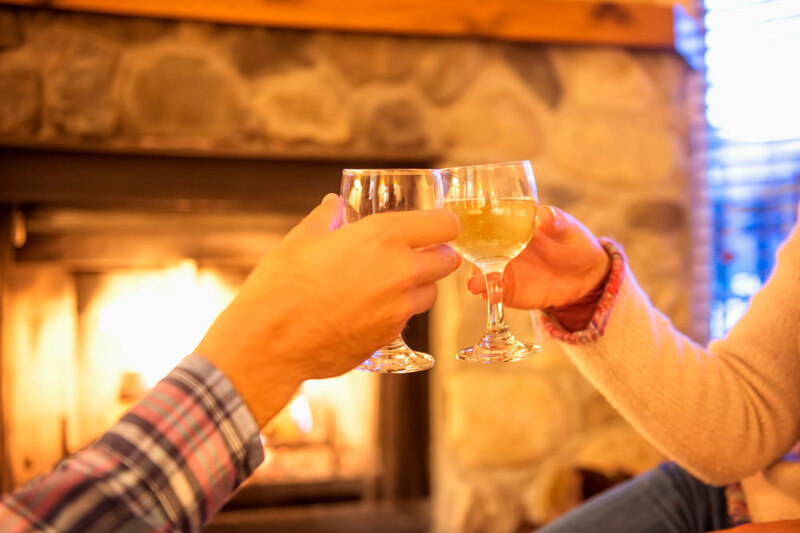 Enjoy sipping and supping your way through apres-ski hot spots, moonlit dinners and brewery/distillery tours, all within one of Canada’s most beautiful landscapes – the stunning Rocky Mountains. Hops might not be the first thing that jumps to mind when you think of ski resorts, but Alberta has a bubbling craft beer scene that comes to a head at the annual Banff Craft Beer Festival, to be held this year on November 25-26. They call it the world’s most beautiful beer festival, as it’s set in the Cave & Basin National Historic Site – think warm mineral springs inside a cave, and outside in an emerald-coloured basin. Last year’s event featured more than a dozen Alberta breweries. Among the line-up were the Jasper Brewing Co (Canada’s first national park brewery) and the Banff Avenue Brewing Co, both of which you can visit. Try the blueberry vanilla ale at The Jasper Brewing Co Brewpub & Eatery to wash down your BBQ pork ribs and buffalo wings. Or how about the Head Smashed IPA (a reference to Alberta’s Head-Smashed-In Buffalo Jump World Heritage Site) with your Atlantic lobster maki roll? For those who like the harder stuff, head to Park Distillery in Banff National Park, where the vodka is made from water from six Rocky Mountains glaciers and grain from high-altitude family farms in the Alberta foothills. Flavours include vanilla, espresso and chilli vodka. Meanwhile, the food is campfire-inspired – wood-fired, spit-roasted, smokey-savoury – but it’s hard to go past the cheese and whisky fondue. Free tours of the distillery are also on offer. Every winter, Bon Appetit Banff warms the cockles of skiers and non-skiers alike with 10 days of culinary heaven. More than 30 restaurants in Banff and Lake Louise offer three-course menus at fixed prices. Or you can join the Dine Around Banff event, a moving feast of three courses at three different restaurants; as well as any number of pop-up events. For something extra special, take a 10-minute open chairlift ride on a full-moon night, rising above the clouds to the historic Cliffhouse Bistro at 2,130 metres on Mount Norquay. Built in 1959, the newly renovated alpine restaurant serves up Kuterra salmon and 24-hour bison brisket thanks to executive chef Morne Burger. More heightened dining can be had a short gondola ride away at Lake Louise Ski Resort’s Whitehorn Bistro (Whitehorn Lodge) at 2,040 metres, with unparalleled views of the Canadian Rockies. Try the Rocky Mountains game platter or the Bison burger. Also stop in at Kuma Yama Sushi in the Lodge of the Ten Peaks, for steaming ramen bowls and specialty rolls. For high-class Canadian-inspired cuisine, look no further than Eagle’s Nest Dining Room at Sunshine Mountain Lodge. From this eyrie, with views of Lookout Mountain, you can feast on such menu items as Alberta beef carpaccio, Nova Scotia seared sea scallop and Prince Edward Island seafood risotto. Not bad, eh? Apres-ski is the heart of the social scene in Jasper and Banff and these live-music hot spots are sure to heat up your night – every night of the week. In Banff, hit the raucous Wild Bill’s saloon for mostly country/rock acts, as well as karaoke and bullriding on Tuesdays. The Rose & Crown, Banff’s oldest pub, has DJs, jugs of Kokanee and staples like fried chicken and spag bol. To go clubbing in a national park, visit Jasper’s Atha-B nightclub, part of the Athabasca Hotel. You’ll find live bands on Friday and Saturday nights in winter, as well as DJs, and karaoke. The Whistle Stop Pub in Jasper has 11 beers on tap, live music, jam sessions, pool tables, and claims to serve the best cheeseburger and fries deal in town. And in Lake Louise, the Powderkeg rates a mention for its view of the slopes and its towering nachos, not to mention the hot chocolate and hot apple cider to warm your bones. Hot coffee, cold beer and live music make the perfect apres-ski combination at the Kokanee Kabin, also at Lake Louise. So whether you’re a fearless skier or a fireside feeder, you’ll get your fill in Alberta’s winter playground. Can More Cost Less When It Comes To Travel Insurance?